Every business that employs people needs an employee handbook. Yep, you heard that right. Every business needs one. Well, ok, maybe if your business only has one employee, and that employee is your husband, child or dog, then perhaps not. But once your business grows beyond the one-(wo)man shop or closely-held family operation, it needs a handbook. Why, you say? The reasons to have an employee handbook are many, and will vary depending on the type of business, the number of workers the business employs, and the type of work they perform, among other factors. But there are a few (nearly) universal truths about the need for an employee handbook. Today we're going to share with you some of those universal truths (that's right folks, this is the holy grail of employee handbook knowlwedge, right here!). Look for future posts in this series on what that requisite handbook should contain and how it should be distributed, among other things. 1. The Handbook Provides a Platform for Legally Required Notices. The number one reason on our list that every business should have an employee handbook is that the law requires it. Well, the law doesn't technically require a handbook per se, but companies are required to publish certain policies and the handbook provides a convenient and readily accessible place to do that. Examples of policies companies are required to publish and distribute will vary, depending on some of the same factors mentioned above (i.e. company size, location, type of business, etc.) but may include drug-free workplace and/or drug testing policies, equal employment opportunity policies, background check policies, and workers' compensation policies, among others. More on handbook content here another day, but for now, suffice it to say that you need one as a handy collection spot for certain policies that your company is required to publish. 2. The Handbook Establishes Employee Expectations. 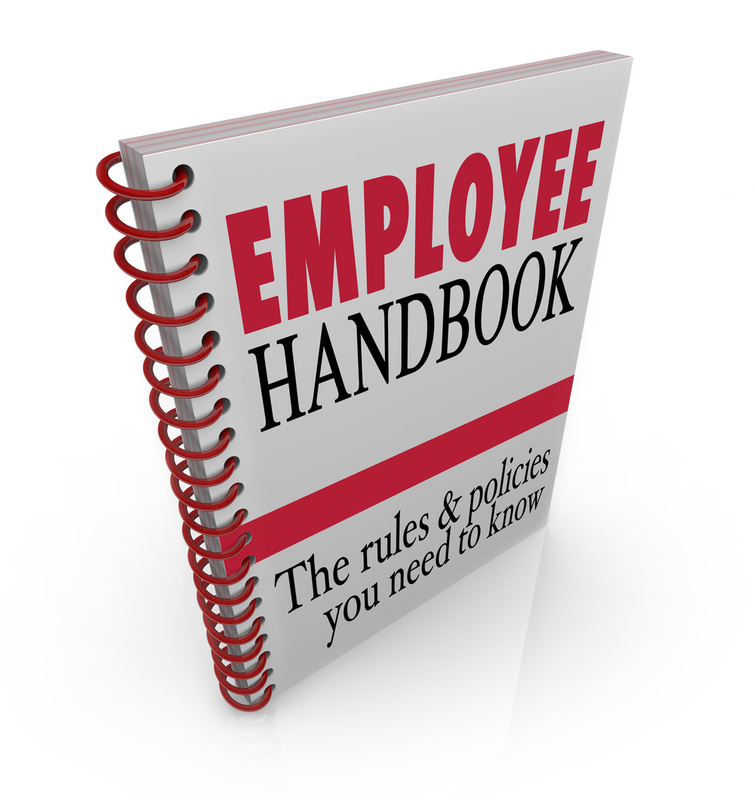 The handbook is also important for setting and maintaining employee expectations. When the employer makes its rules and preferred procedures known, they become part of the company culture. You wouldn't expect your child to obey a rule she doesn't know about, so why should the situation be any different for your employees? Employees perform better, and everyone is happier as a result, when everyone is on the same page about how the workplace will operate. Setting expectations is therefore not just good for morale, it's good for business. Work is done more efficiently because everyone from management on down can focus on getting the job done, rather than on whether and how to do it. 2. The Handbook Guides Management Behavior. The old adage that the team is only as good as its worst player holds true in the workplace, particularly as to management. Even one aberrant manager who is not on board with the team plan can wreak havoc on the workplace, not just causing disruption and lapses in productivity but also exposing the company to liability (more on that below). A good employee handbook sets basic standards for job performance, establishes procedures for handling policy violations and other difficult situations, and delineates appropriate lines of communication when either workers or managers face challenges or concerns. An employee handbook cannot possibly anticipate every circumstance that may arise, but it can offer sufficient generalized guidance to get managers started in most situations and inculcates a culture of fairness and uniformity as a result. 4. The Handbook Can Be a Scapegoat. Perhaps one of the most valuable roles an employee handbook can serve is that of a scapegoat. What I mean by this is that when an employer has to make a difficult decision about a challenging employee, the handbook can provide much-needed support and validation for the action taken. For example, an employee handbook should specify expected work hours and permissible reasons for tardiness or absence. When an employee's attendance becomes problematic, management can point to the employee handbook to vindicate any disciplinary action taken. Likewise, an employee who violates a clearly established rule against, for example, coming to work under the influence of alcohol, should not be surprised when her employer punishes her behavior, because the rule -- published in the handbook -- was well known. 5. The Handbook May Serve as Key Evidence. Beyond its important role as a scapegoat, the handbook may also determine, or at least affect, winner and loser, should litigation arise. Many employee lawsuits challenge the reason(s) that disciplinary action (including, but not limited to, termination) was taken. An employer who can point to a published policy as support for the action it took will find itself in a much better position in the lawsuit than it would be in absent any clear directive. Indeed, it is unusual that an employee handbook is not a relevant piece of evidence -- if not a key one -- in most employment-related lawsuits. An employee handbook is therefore akin to the American Express Card in the company president's wallet -- don't leave home without it.